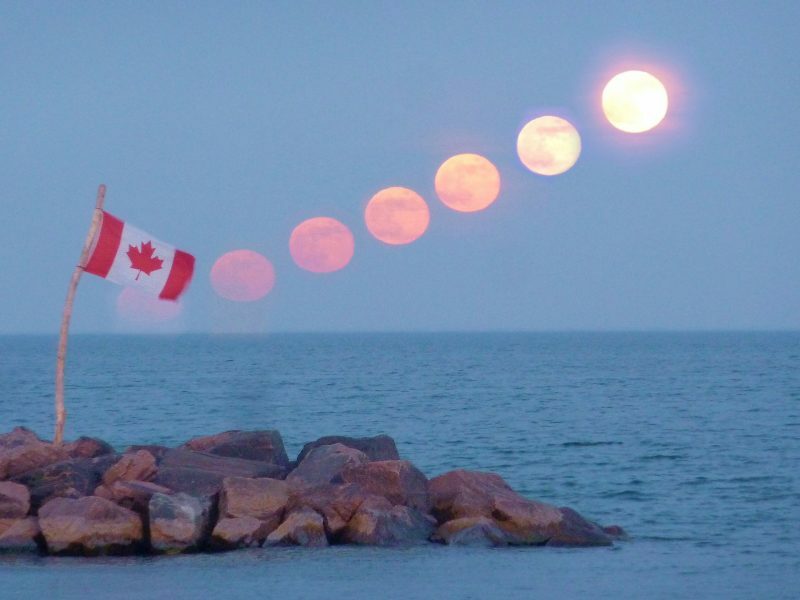 The moon is past full on May 30 and 31. You’ll find it ascending in the east several hours after sunset. Saturn – now nearly at its best for 2018 – is the nearest bright object. From around the world on May 31, 2018, you can watch for the waning gibbous moon and planet Saturn to ascend in your eastern sky in the hours after sunset. In the Northern Hemisphere, watch for them in mid-to-late evening (say, 10 to 11 p.m. local time). In the Southern Hemisphere, they’ll be up earlier (7 to 8 p.m. local time). The moon rose first on May 30, followed by Saturn. Then, on May 31, the moon and Saturn more closely rise in unison. Click here for recommended almanacs; an almanac can give you the exact rising times for the moon and Saturn in your sky. Remember, these rising times assume an unobstructed horizon. If you have trees, mountains or whatnot blocking the sky, you’ll have to wait until later before seeing the moon and Saturn. Just don’t mistake Jupiter for Saturn. It’s already up in the east at sunset, much brighter than the ringed planet. “Hello from Toronto!” wrote Steve Thamer on May 29, 2018. Submit your photo to EarthSky. And there’s an even brighter object in your western sky after sunset. It’s Venus, the brightest of all the planets. Jupiter will lead the moon and Saturn into the sky on each of these nights (May 30 and 31). Meanwhile, around the time Venus sets for the night, you can look in the opposite direction to view the moon and Saturn coming up below Jupiter. 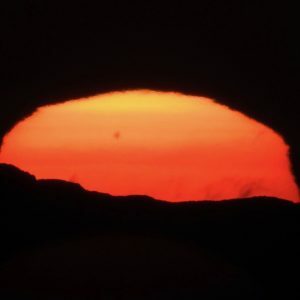 In other words, in late May 2018 – as viewed from around the world – Venus sets in the northwest at roughly the same time that Saturn rises in the southeast. In fact, if you have an absolutely clear horizon, you might briefly see Saturn opposite Venus in the sky, just before Venus sets. Saturn is rising earlier daily, while Venus is setting later daily. 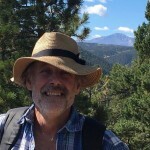 So – if you can’t see the two together in the sky now – by the second week or so in June 2018, there’s a good chance that you’ll see Saturn opposite Venus at nightfall. The Cassini spacecraft acquired this beautiful natural color mosaic as it soared 39 degrees above the shaded side of Saturn’s rings on May 9, 2007. Image via NASA JPL/Space Science Institute. On June 27, 2018, Earth will be flying more or less between Saturn and the sun. Saturn will appear opposite the sun in our sky, at what astronomers call opposition. At opposition, Saturn will rise around sunset and set around sunrise. It’ll be visible from dusk until dawn. Jupiter was at opposition on May 9, 2018. All the superior planets – planets orbiting the sun outside of Earth’s orbit – come closest to Earth for the year at or near opposition. It’s also at opposition that a superior planet shines at its brilliant best in Earth’s sky. Opposition happens when Earth flies between an outer planet, like Jupiter, and the sun. This happens yearly for most of the outer planets (except Mars). Illustration via Heavens Above. Even at opposition, Saturn never gets very close to Earth. It is, after all, the most distant major planet we can see easily with the unaided eye. What’s more, this year presents an unusually distant opposition of Saturn. 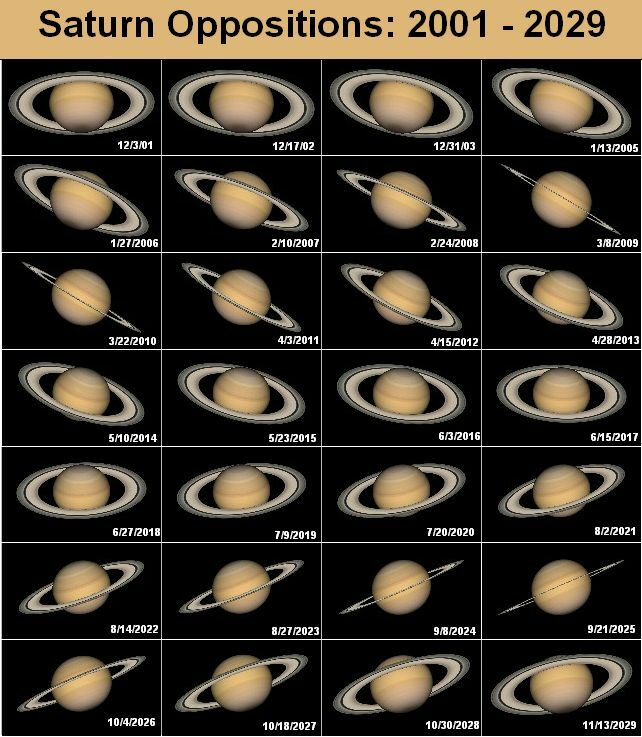 This year’s opposition finds Saturn at 9 astronomical units (AU) from Earth; that’s 9 times the Earth-sun distance. It’ll be 10 AU from the sun, in other words. Why a particularly distant opposition in 2018? It just so happens that Saturn swung to aphelion – its most distant point from the sun in its orbit – on April 17, 2018. The last time Saturn was at aphelion was September 11, 1988, and the next time won’t be until July 15, 2047. By contrast, when Saturn is at opposition in a year when Saturn is at perihelion – nearest point to the sun in its orbit – Saturn is one AU closer to the Earth and sun than when it’s at aphelion. At opposition in those years, Saturn swings by at 8 AU from Earth and 9 AU from the sun. Saturn was last at perihelion on July 26, 2003, and will next reach perihelion on November 28, 2032. The tilt of Saturn’s rings has a great impact on the planet’s overall brightness as seen from Earth. That’s why – although 2018’s opposition is distant – the planet isn’t particularly dim this year. 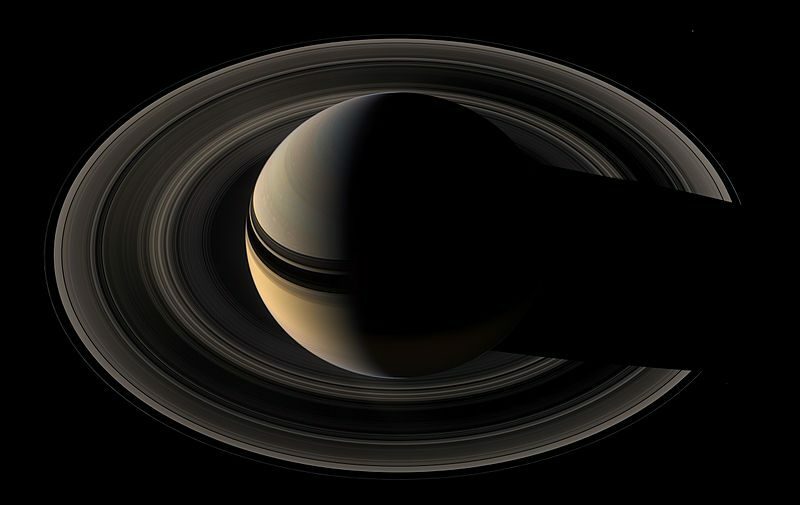 In years when Saturn’s rings are edge-on as seen from Earth (2009 and 2025), Saturn does appear considerably dimmer than in years when Saturn’s rings are maximally tilted toward Earth (2017 and 2032). Image via Wikimedia Commons. Surprisingly, the year 2018 doesn’t present a particularly dim opposition of Saturn – although it’s a distant opposition. That’s because the tilt of Saturn’s rings plays a big part in Saturn’s overall brightness. In 2018, Saturn’s rings tilt almost the maximum 26 degrees toward Earth, reflecting sunlight our way. When Saturn’s rings are edge-on, as in the years 2009 and 2025, they don’t reflect as much sunlight toward Earth, so Saturn’s brightness is reduced in Earth’s sky. Bottom line: Let the moon be your guide to Saturn on May 31, 2018. This planet is now nearly at its best for 2018. Its opposition will come on June 27, 2018.